Hontareva has announced simplified exchange regulations. 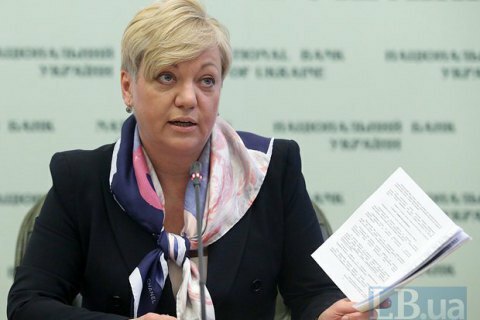 The National Bank of Ukraine (NBU) has increased the limit on the exchange of foreign currency by the population from 3,000 up to 6,000 hryvnyas per day (112 and 225 dollars respectively), NBU head Valeriya Hontareva said at a briefing on Thursday. The limit on withdrawal from deposits has also been increased from 20,000 up to 50,000 hryvnyas in the equivalent (752 and 1,882 dollars respectively), in the national currency, from 300,000 up to 500,000 hryvnyas (11,292 and 18,820 dollars respectively). "The National Bank has decided to continue the gradual liberalization of the current administrative restrictions on the foreign exchange market. This decision is based on the signals attesting to the gradual growth of trust in the banking sector and stabilization of the exchange market," she says. Individiuals' deposits grew by 22.7bn hryvnyas in the second half of 2015. The same tendency is being observed in 2016. Second, Hontareva added, the population sells more foreign currency than buys. In 2015, the net amount of foreign currency bought by banks reached 1.5bn dollars, in January-February 2016 – 261bn dollars. Third, the NBU sees sufficient exchange liquidity in commercial banks, as confirmed by their demand for government domestic loan bonds issued by the Finance Ministry. Since the beginning of the year, the state has sold bonds worth 917m dollars. "Thus, we remain consistent in our intention to liberalize the exchange regulations. We took this path in the autumn after the state loan had been restructured; now we are further softening the restrictions as appropriate conditions are in place. This is a stable situation in the banking sector," she said. At the same time, the NBU decided to keep the current 22-per-cent discount rate without changing its monetary policy. Exporters will still be required to sell 75 per cent of foreign currency proceeds for another three months.